Stir-fried red bell peppers are smothered with a sweet and sour sauce and served over a cushion of pan fried Chinese noodles that are crispy on the outside and creamy inside. 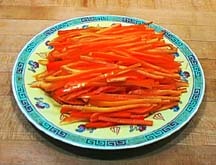 To make this dish look appealing, the appearance of the red pepper slices should be uniform and thin. Also, there should be enough sweet and sour sauce on the peppers to saturate the crispy outer layer of the noodle cushion to soften it. You could add some zip to the dish by using a few chile peppers along with the red peppers. This is a basic recipe for a light Sunday Supper. Other vegetables (such as onions, broccoli and carrots) could be added to the red pepper stir fry for color, taste and/or texture and it could be accented with thin slivers of Smithfield Ham. The Scarlet Ribbon Chinese Noodles should be accompanied by either a green salad or a cold vegetable salad with an oriental vinaigrette dressing to complete the meal. As in all Chinese dishes, the time consuming part is getting all of the ingredients ready before you start cooking. The cooking part takes less than 10 minutes. You could make one big cushion in a 10-12" diameter pan and cut it into wedge-size servings or make several small, 4-6" cushions for individual servings. Cut the peppers in half, lengthwise. Seed them, cut each piece in half again (now you have 4 quarters) and then carefully cut out the inner white membrane with the tip of a sharp knife. Trim off the top and bottom of the quarters so they are exactly the same length. Cut the quarters into thin ribbons and set aside. If you are using Smithfield ham, cut it into very thin slivers and set aside in a small bowl. In a small bowl or measuring cup, mix together the vinegar, sugar, soy sauce, pineapple juice and ketchup. Stir until the sugar is dissolved. Peel the garlic (remove the green inner sprout if there is one) and dice it. In a small bowl, add cornstarch and gradually stir in the water until smooth. Set aside all of these ingredients. Open the package of fresh noodles and spread the bundles apart so the noodles won't stick together during cooking. Have a large pot of boiling water ready to which you have added a teaspoon of sesame oil to prevent the noodles from sticking together. Cook the noodles in rapidly boiling water for about 4 minutes. In a colander, rinse with cold water to stop the cooking and drain thoroughly. Sprinkle with a little sesame oil and lightly work in the oil with your fingers to prevent the noodles from sticking together as they cool. Spread them on a paper towel in one layer and place another paper towel on top. Roll them up and set aside until ready for the final frying. Coat the bottom of a flat bottomed pan with a generous (but thin) layer of peanut oil and heat well. Don't let the oil start smoking. 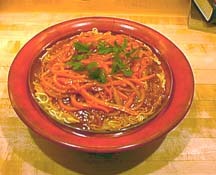 Place a few handfuls of noodles in the hot pan in an even layer about a �" thick. (The amount you use depends on the size pan you have selected.) With a spatula or fork, tuck the loose edges into main body and generally press the noodles together to form a perfectly round cushion. Let the first side brown, then flip it to brown the other side. When both sides are crispy and brown, remove the cushion to a serving plate and keep in a warm oven. In the same wok, add the vinegar mixture and heat over a high flame until it begins to simmer evenly. Add the diced garlic. With a large wire whisk, gradually stir in the cornstarch mixture and continue to cook, while stirring slowly, over medium heat until the sauce becomes translucent and thick. Add the peppers and stir just enough to coat them with the sauce. Smother the noodle cushion with the "scarlet ribbons" and serve immediately. Decorate with sprigs of Chinese parsley and serve with a green salad or cold vegetable salad dressed with an Oriental Vinaigrette (see Spicy Asian Pesto recipe). Appearance: As in most Chinese dishes, the appearance of the dish is very important. Appearance results from the skillful use of the knife to cut the vegetables in a precise, uniform size. Take time to do the cutting carefully. The visual serenity of their uniform size will enhance the overall experience of the dish! Smithfield Ham: This type of ham is the closest equivalent to Chinese Yunan ham, which would be used in such a dish in China but is not readily available in the U.S. In San Francisco, grocery stores in Chinatown sell Smithfield ham by the slice so we don't have to buy a whole 10lb. ham. If these small quantities are not available in your area, you could use tasso or a similar dense and highly flavored dry- cured ham. Sauce: Every time I make this recipe, I vary the proportions of the sauce ingredients to suit my mood. The recipe given here is on the vinegary and garlicky side. You may want to alter the balance to suit your own taste. Measuring cup: I prefer to use a measuring cup so I can quickly measure the ingredients as I add them cumulatively to the cup. Green inner sprout: I am a fanatic about this step. If you are using older, mature garlic, you will find a light green sprout inside the clove when it's cut lengthwise. The sprout is indigestible and bitter and should be removed. Once I experienced the subtle benefits doing this, I could never stomach using a clove of garlic without removing the sprout. Smooth: The texture should be quite runny so it's easy to incorporate into the sauce during cooking. If your cornstarch mixture is not "runny", then add a little more water. Pan: I use a steel omelet pan with a 6" diameter flat bottom, which is ideal to make individual-sized noodle cushions. Flipping: If you have chosen to make a big "cushion" instead of the individual-serving size and can't flip it in one stroke, then first invert the cushion from the pan onto a well-oiled cookie sheet with no lip on one side and then slide it back into the frying pan to which you have added more oil. Diced garlic: Adding the diced garlic at this point will give the sauce a strong garlic flavor. If you prefer a less pungent garlic flavor, stir fry the diced garlic first in a little oil, then add the vinegar mixture and proceed from there to add the cornstarch. Green salad: To give your green salad a little "oriental" flavor, you could add a few sprigs of Chinese parsley, mustard greens cut into thin ribbons, or tatsoi. Vegetable salad: Lightly steam summer squash and carrots (which have been cut using the "Chinese rolling cut" (picture) and green beans just to the point of taking away their raw crispness. When done, immerse the vegetables in ice cold water to stop the cooking. When cool, remove from the ice water and pat dry on a towel. Toss the vegetables with an oriental vinaigrette and serve at room temperature.